This is what Zoey got into last week! Thankfully she wasn't seriously hurt. I think her feelings were hurt more than anything, but I managed to pull all of the quills out...This is her ''second'' porcupine she found... the first one wasn't as bad as this- I guess she was more mad the second time! I hope she learns.... I don't know the full story of either time, but she came back to camp looking pretty sheepish... I am glad she just lays there and lets me pull them out, and doesn't make a scene! Does anyone else have any storys to tell about their dogs and a porcupine?? OUCH. NO, thankfully, I have no such stories to tell. Did she have to see a vet? That looks pretty severe! Ouch! Poor baby! I have no stories of that nature either but I do hope for her sake that she has learned her lesson! Oh my goodeness! The poor little sweetie! Yikes, I don't think we even have porcupines around where I live, not that I've ever heard or seen anyway - thank dog! Awww..Poor Zoey, I really feel for her. How painful that must of been. When I was growing up we used to let the dogs run free, we lived in the middle of nowhere and could not even see the road from the house, but no it was no safe to let the dogs run free, Porcupines were a big reason why. The dogs would come home occasionally with quills. My father would take the quills out himself, It was so pitiful the way the dogs would yelp having those quills extracted from their faces. The saddest day was when Griffin and Cheemo came home with a really bad infestation of quills, WE were able to get the quills out of Cheemo, but Griffin who was a Corgi/American Eskimo cross could not be saved. He must of tried to bite right into that proquipine because the quills went clear down his throat and were pushing themselves in further. He had even swallowed some. The vet could not save him and he had to be put down. Before he left for the vet he was not the same dog, The glassy look in his eyes told us he knew he was leaving this world. He remained so calm during despite the pain and discomfort he must of been feeling, I know he held back from showing his pain to make it easier on my mother and me, but no it was not easier. It was devastating, especially for my mother, he was her heart dog. My mom went into a depression over the loss of Griffin. Now i know there was no way possible that this was the fault of the porcupine, they do not deliberately harm dogs, dogs are normally 100% of the time the instigators when it comes to porcupine incidents. but still because of the loss of Griffin, I cannot help but have a strong distaste for the animal. It is now 15 years later and even now when I catch the sight of a porcupine(which is far too often) the first thing that pops into my mind is my poor Griffin's last moments. 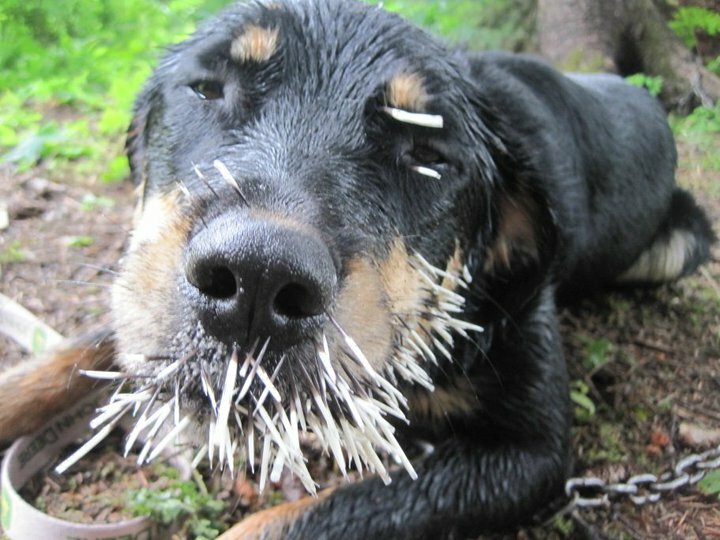 I know its a sad story but I just want to tell you this because sometimes there isn't always a happy ending for the dog when it comes to porcupines. Please be careful with Zoey, Porcupines may not want to hurt your dog but they really can cause some serious harm and if Zoey sees another porcupine you can bet that she will not just watch away. Dogs NEVER learn their lesson when it comes to porcupines, their urge to go after them just grows stronger each time they encounter them, their attraction to porcupines are like moths to a flame, they don't learn and with every new encounter the dog's(attack if what you will call it) just gets more and more tenacious. This would probably be why Zoey's second infestation was even worse than the first one. I don't know if it is a revenge thing on the dog's behalf but if the dog continues to go after porcupines, no good will come of it. Zoey is a beautiful dog, I would hate to see her be seriously harmed because of a porcupine. Please be vigilant with those porcupines. Also, do you double check Zoey after you remove the quills? I ask this because quills have little prongs that cannot be seen by the naked eye, these prongs allow the quills to work themselves deeper and deeper into the skin, sometimes until they are completely embedded. The vet could not save him and he had to be put down. Before he left for the vet he was not the same dog, The glassy look in his eyes told us he knew he was leaving this world. He remained so calm during despite the pain and discomfort he must of been feeling, I know he held back from showing his pain to make it easier on my mother and me, but no it was not easier. It was devastating, especially for my mother, he was her heart dog. My mom went into a depression over the loss of Griffin. That story made me sad... I am so sorry about Griffin. that must have been so awful.. I have been keeping a close eye on Zoey since- I have heard of bad things like that happening, and I WISH they did learn. I also wish I could catch her in the act of finding one, then I would beable to tell her NO when she goes near it.. she seems to listen when I tell her things like that? And since both times with the porcupine, I have checked for quills daily. There are no obvious signs of anymore quills thank goodness!